0.50mm End Mill with ring, used to mill large paths in the FR4 boardmaterial. End mills are used to mill large paths in the FR4 board material. The width of the cutting edge of an end mill is the size of the end mill. 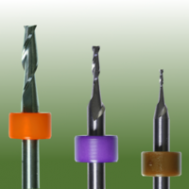 FR4 is highly abrasive and requires the use of specialist end mills, PCB Supplies supply the highest of quality End Mills made of high grade Tungsten Carbide which feature very high cutting performances whilst maintaining the tightest production tolerances. These mills can be used for copper removal by providing straight-sided and flat-bottomed isolation paths with minimal penetration into the substrate. Recommended for insulation milling of RF and Microwave circuitry. Endmills include distance rings for systems with automatic tool change. Used for rub outpaths. We hold stock of End Mills ranging between 0.1mm diameter and 3.0mm diameter, all of which have a two flute geometry.